Plasma lighters are butane-free, electronic lighters (Source). With a quick click, it generates either a single or double arc plasma flame that's hotter than fire (Source). They work by generating a tiny electrical arc between a pair of ceramic electrodes. This small arc is hotter than a traditional open flame (Source). If you're a cigarette smoker- a single arc (two-electrode) flame is fine. It generates less heat over a smaller area. If you're a cigar smoker a double arc (four-electrode) flame provides 2x coverage for the wider circumference of a large cigar. If you're a pipe smoker, the cylindrical Saberlight is marketed specifically to pipe and bowl smokers. A word of caution- don't use a plasma lighter with a metal pipe: it will shock you (Source)! Buyers say that this single arc, plasma lighter works well for cigarettes and starting camp fires. It's got a high-tech appearance- the arc is small, but incredibly hot. This is a two-electrode arc lighter, which means it has a single arc. It comes with a gift box- a solid, value buy. 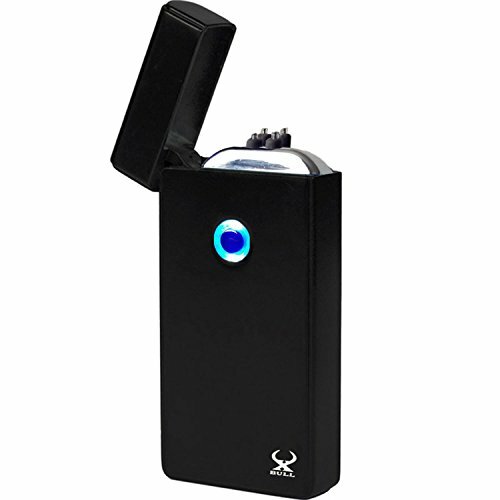 Reviewers say that this double arc, plasma lighter is a powerful, wind-proof option that works well for cigars. One boater praises its wind-resistance- saving his finger from blistering constantly flicking cheap Bic lighters. 1# BEST MAN / WOMEN GIFT ON AMAZON, Innovative Electronic lighter, NO More Narrow Arcs as other lighters. 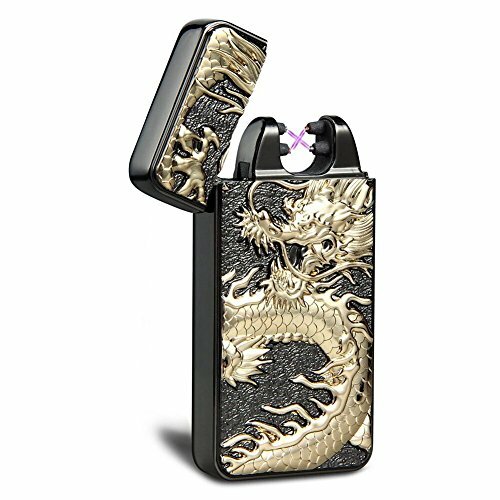 Innovative Technology Plasma lighter with double power, plasma beam arc, works by creating an electric arc with one press of a button, 2 Arcs lighter in a sleek and Elegant design. simply charge up via USB and you're ready to go, cool man gift. 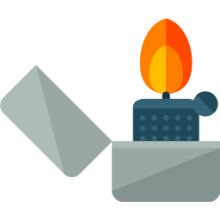 LIGHT MORE ITEMS THAN TRADITIONAL ARC LIGHTERS: IT'S LIT Lighters Use A Large, Flat Surface Design. 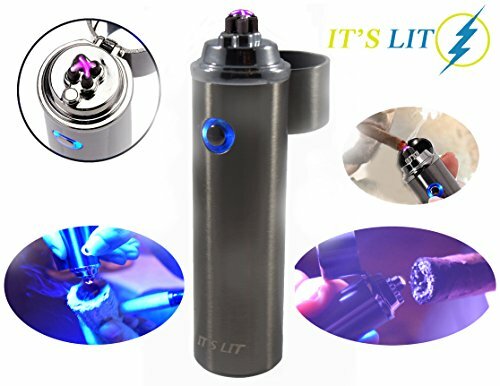 This Enables The Lighter To Be Used Where Other Arc Lighters Can't; Such As On PIPES, CIGARS, BOWLS, WATER PIPES, CIGARETTES, CANDLES, INCENSE & MORE. Unique Patented Design: Elegant body made from high-quality frosted materials gives you the luxury experience, solve the problem of fingerprint residue. 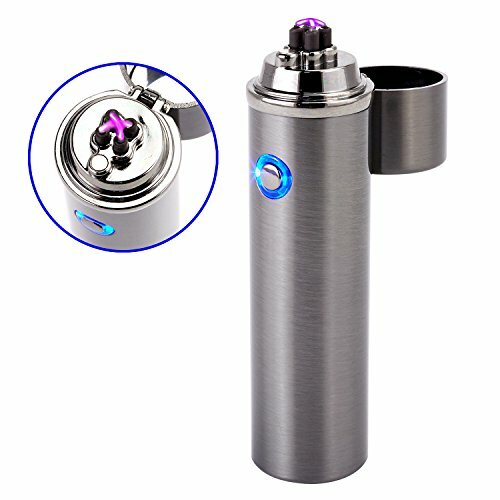 The unique Anglink arc electric lighter with four vertical poles ignition uses more innovative technology and creative design to completely solve the issue of the traditional arc lighter which is limited by narrow space when it is ignited. NEW DESIGN75°slope pole design,more evenly,old design lighter are limited by a narrow neck.rechargeable battery,electric lighter. Double electric arc-superior firepower to ignite, 5 times more powerful than single arc lighters. 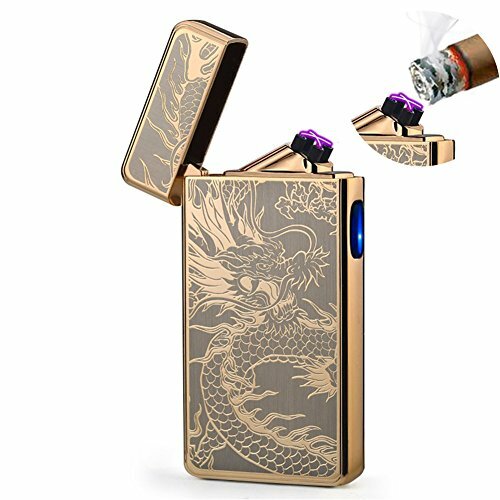 NEW DESIGN 75°slope pole design - cool lighter,light small cigars and cigarettes more evenly,old design lighter are limited by a narrow neck so they can't light cigars with flat surface. 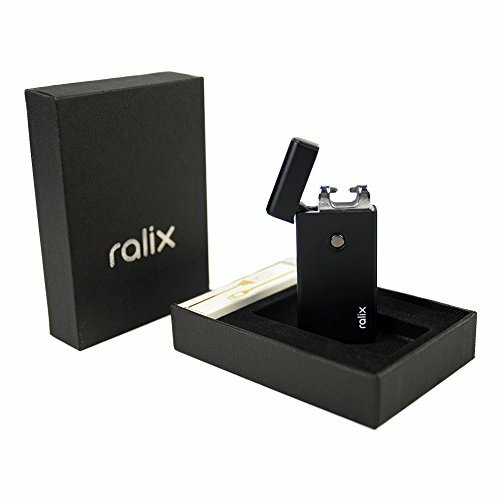 This single arc plasma lighter offered by Ralix is a solid option if you are looking for a flame less lighter. Users like the handiness and design of this gadget, but do complain about the fact that it doesn’t fit regular size cigars. This USB rechargeable lighter is wind-resistant and it doesn’t use gas or fluid. It is made of durable zinc alloy that won’t melt or fall apart. This rechargeable electronic lighter seems like a solid choice if you are looking for an elegant yet sturdy product which is environmentally friendly. The general user consensus concerning the Ralix flameless lighter is that it is a cool gadget that does the job. They state that it is well-built, with the matte finish that looks very nice. It comes in a package that makes it a good gift. However, many buyers complain about the fact that, although great for cigarettes and cigarillos, it is not suitable for regular size cigars. Plus, they state that the lighter is useless with candles that are inside glass holders because of its design. One online reviewer says that if used extensively and/or continuously it will heat up to the point you can’t hold it. 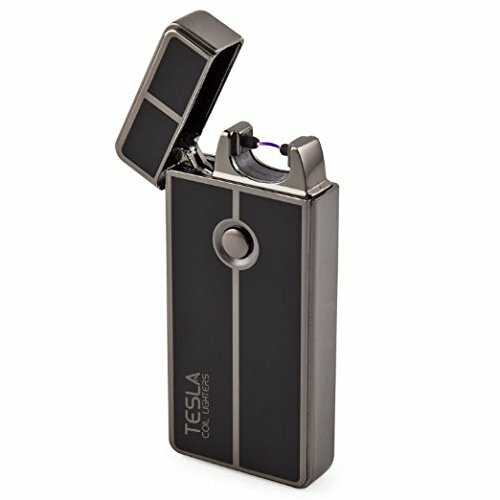 This USB rechargeable lighter offered by Tesla Coil Lighters is a solid option if you are looking for a windproof arc lighter. Users like the effectiveness of this gadget, but do complain about some design flaws. This product works by creating an electric arc with one press of a button. It has a safety feature, so it will not light up when the lid is closed. When fully charged, it can last up to a week or 100-300 uses. It is available in 6 colors: gun metal, black/gold, black/silver, blue, espresso and orange. This plasma lighter might be a nice gift due to its elegant design. In general, users have a favorable opinion of the Tesla Coil Lighters rechargeable plasma lighter.What they praise is that it has a good-quality, heavy construction and isn’t flimsy at all. Moreover, it works well and lights cigarettes faster than most users expected. However, many purchasers complain about its design, namely the contacts being too close which makes it hard to light a cigar or a candle that’s inside a glass holder. Some buyers claim that their lighter didn’t last long. If you are looking for a top-rated plasma lighter, you might want to consider this flameless plasma torch lighter offered by Saberlight.Users love the efficacy of this gadget, but some do complain about certain design drawbacks. Unlike many similar items that are limited by a narrow Tesla coil, this re-designed plasma lighter can be used to light larger things, such as bowls, pipes and cigars. It features a more powerful technology to eliminate the narrow Tesla coil and create dual plasma beams in the open. 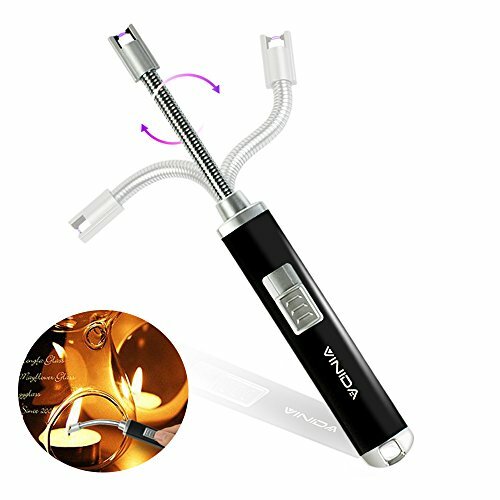 If you want a flameless lighter that is suitable for both cigarettes and cigars,this plasma torch lighter might be a good option. In general, users have a favorable opinion of the Saberlight Sparq rechargeable plasma torch lighter and they agree that it is built very well and does the job great. As they say, it recharges quickly and all in all is a very good and stylish gizmo. However,one purchaser has a complaint regarding a loose lid. 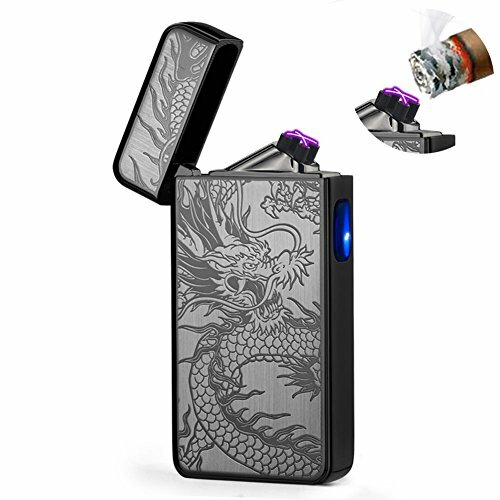 This flameless plasma dual arc lighter offered by Novelty Wares is a good option for those who need a rechargeable, windproof lighter.Users love the effectiveness and design of this tool, but one buyer warns to be careful when using it. 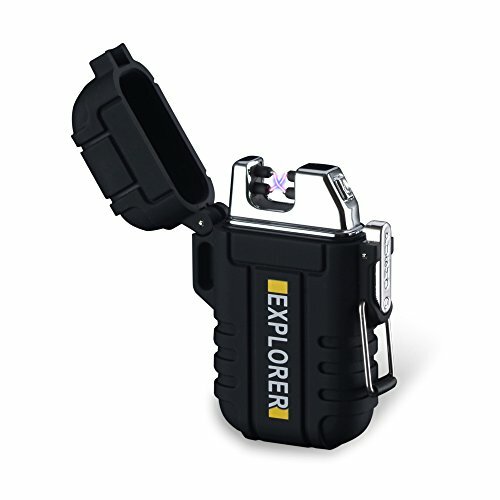 This product is a rechargeable, double arc, flameless, windproof and butane-free lighter. It comes in a beautiful elegant gift box with USB charging cable. It features solid corrosion resistant metal construction that works in all weather conditions.It comes in 6 colors: gold, gun metal, navy blue, neon/rainbow, rose gold and wood. 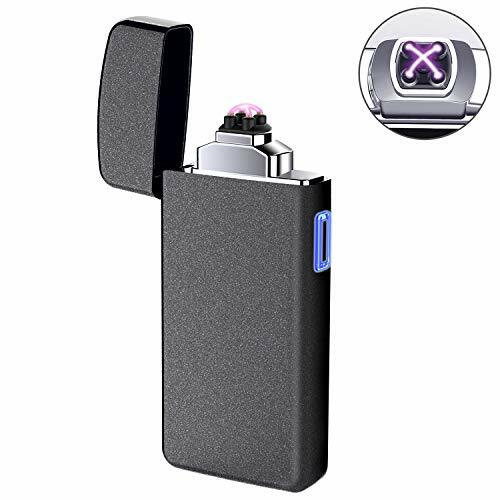 This USB rechargeable windproof lighter could be a good choice if you want a flameless lighter for cigarettes, candles, incense, campfires etc. In general, buyers have a positive opinion of the Novelty Wares dual arc plasma lighter. They state that the electric “flame” is both mesmerizing and incredibly effective, even when faced with the wind. In addition, the unit stays charged for about a week and it charges quickly (in less than two hours). One happy purchaser says that the lighter is sleek and elegant. However,one buyer advises being careful when using the lighter. He states that he felt a little jolt when his hands were wet. 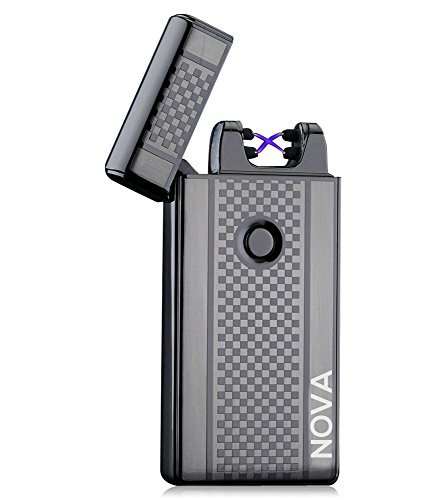 If you are looking for a flameless lighter, you might want to consider this USB rechargeable electric plasma lighter offered by Nova. Users like its usefulness, but do complain about charging issues and several design drawbacks. This product features a double arc, which is great because it has double the power compared to a single arc lighters. It is windproof, USB rechargeable and comes with 60 day warranty. The lighter is available in 5 colors: gold, gun metal silver, mythical, solid gold and solid silver. If you are looking fora flameless lighter for yourself or to be given as a gift, this might be a solid option. In general, users are happy with the Nova plasma lighter. What they like in particular is that it is useful, great in all conditions and lights things very quickly. Plus, it charges fast, holds a decent charge (about a day or 1 pack of cigarettes) and looks fairly attractive. However, some purchasers complain about the fact that the beams don’t light extremely thick items. As they share, anything you want to light has to fit within the half inch space provided.Another frequent complaint is that the charge doesn’t last quite as long after lots of use. One dissatisfied buyer says that, although it is a very cool concept, it is a little strange in practice since it makes a high-pitch noise that is hard to ignore. The first electric plasma lighter we examined was the Ralix option. It's marketed as a wind-resistant, rechargeable, flameless solution for easily lighting candles, cigarettes, cigars and ships with a USB charger. They say that all you have to do is simply click it and the electric lighter will provide a flame in a safe, efficient and effective manner. It's built from zinc alloy and doesn't use gas fluids- the manufacturer says that with a full charge it commonly lasts a little over a week or 300 ignitions. 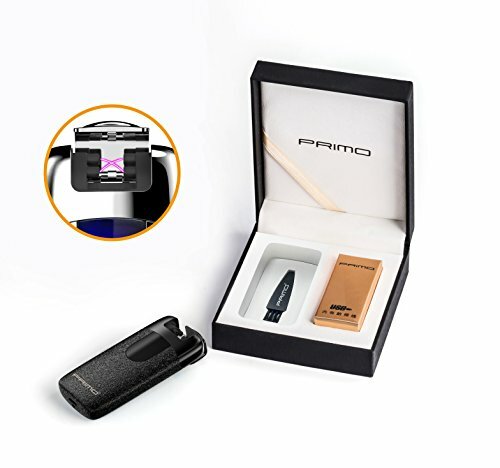 Buyers, for the most part, were fairly impressed saying that it's a great gift idea for the cigar or cigarette smoker in your family- with a high-tech appearance. As a two-electrode arc lighter it produces a simple arc flame and because of its matte finish it doesn't get messy with sweaty fingerprints. One important thing to note, it doesn't work with pipes or that well with large cigars. In terms of maintaining your plasma lighter for the long-haul, you'll want to ensure it doesn't sit out in the sun for long periods of time that it doesn't get punctured, that it doesn't stay lit for more than five seconds at a time. Some buyers wondered whether it makes a noise whenever it lights up and owners of this lighter tell us that it sounds like a taser when it's ignited. Reviewers say that this coil lighter works well- starting camp fires and that is solidly built to avoid breaking when dropped from several feet up. Buyers say that you can get on the airplane with this option, which means it's better than a cigar torch in those instances when you are traveling. One cigar smoker says that while it is not as good as a match, a traditional lighter or a cigar torch, it is highly effective in the wind, and as we mentioned, you can travel with it because it is TSA compliant. One reviewer who suffers from arthritis that limits his finger and hand dexterity says that this was a handy workaround for him so that he can enjoy an afternoon cigar on his veranda. The fourth flameless plasma cigarette lighter we examined was provided by Novelty Wears- it comes in gold, black, neon, rose gold and other colors. It provides a double arc and butane free lighting experience packaged in a corrosion resistant casing. Buyers praise the quality of the electric flame, saying that it truly stands up to strong winds, charges quickly and features a variety of attractive colors. The last option we examined was the Nova electric plasma lighter- this is, as the others are, a windproof option that ships with a USB charger. As other buyers have commented, the noise of ignition does seem to perturb pets-some likening it to a high pitch noise that's barely audible. One buyer takes it out on his boat where it is particularly windy- this is a great way to light up his Marlboro cigarettes as he's fishing.